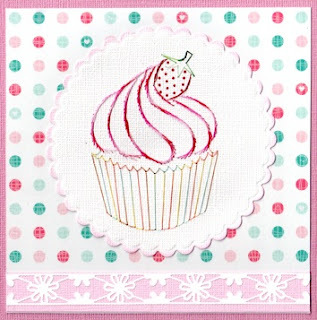 This delicious cupcake was published in HJ75 and is another beautiful pattern by Ann at APA pattern #2048. I have used varigeted thread by chrissie and a red metellic thread for the strawberry. Hobbydots was also used for the strawberry. I used Spellbinders to cut and emboss around the cupcake which I then inked in pink around the edge. 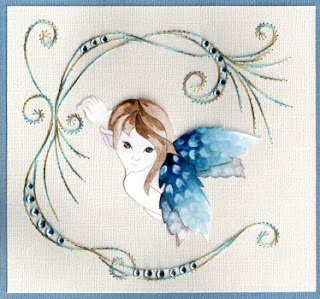 The paper that I have used is by Kaisercraft...Hide & Seek. Along the bottom of the card I cut a fine piece of pink bazzil cardstock and placed a strip of gorgeous decorative lace tape by Christina Re. 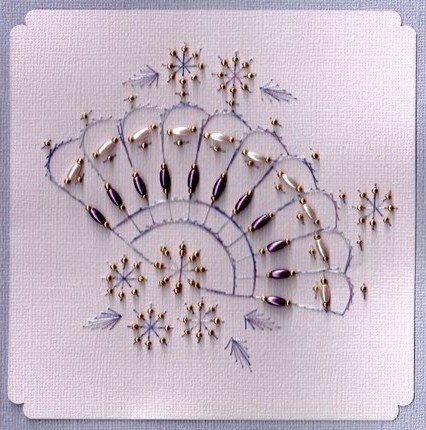 I adore doing cards with beads. 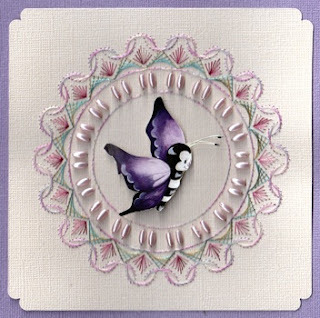 This is a beautiful design created by Ann's Paper Art the pattern # a433. I have used Chrissie variegated threads and lovely pale pink seed beads. This is a card that I have made using a pattern designed by Karin, from Karins Creations KC033 you can visit Karin's website at http://karinscreations.nl/ where you can see Karin's amazing cards. Once again I have used variegated thread by Chrissie. I also added some blue jewels. The lovely 3d image that I have used is by Marieke's Design. I must admit, I started stitching this pattern and I couldn't stop until it was finished. I just loved working with the beads so much. I have used Chrissie thread once again, these are my favorite threads. I have never stitched on black before and I found it to be a challenge, which I loved doing. 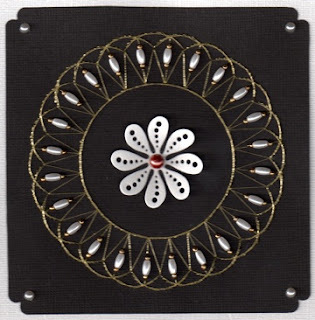 I have used a beautiful pattern by Ann's Paper Art a485, I chose this pattern as it has a lot of beads and I do love beads on cards, it adds that little bit of glamour. 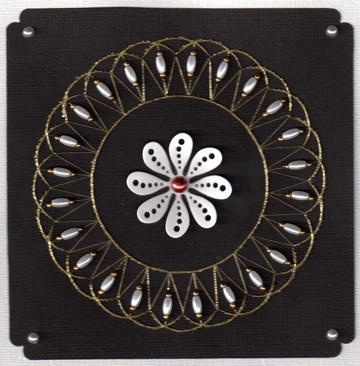 I have used gold metallic thread and ivory rice beads, with gold seed beads on each side. 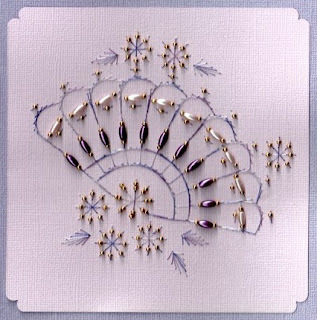 The centre is a die from Mariannes Creatables, I have used a large pearl gem in the centre and smaller ones on the corners.